Looking for things to do in Hendersonville, NC? Whether you’re a local or just passing through we’ve got loads of great tips and events to help you find your perfect adventure. Nutritious Thoughts is offering two new educational support groups. The Diabetes Education and Support Group is open to members of the community who have diabetes (Type 1, Type 2, or Gestational) and would benefit from extra education and support around this disease. The group will meet for an hour on the 1st and 3rd Wednesday of each month from 6 to 7 pm at the Nutritious Thoughts office and will include a short education provided by Registered Dietitian, Margaret Ruch, MS, RD, LDN. The gatherings will also include plenty of time for peer support for members to help each other deal with the daily demands of life with diabetes. “I’m excited to be able to offer this group as there’s a real need for education and support around this issue that is so common in our community,” stated Margaret Ruch, MS, RD, LDN. The second group is open to all those dealing with Poly Cystic Ovarian Syndrome (PCOS) and looking for more comradery and assistance in navigating their relationship with food and PCOS. This group will be led by Registered Dietitian, Katie Rhodes, RD, LDN, and will be held the 4th Wednesday of every month from 6 to 7 pm at Nutritious Thoughts. Uncensored expression: anyone is invited to step up to share song, music, poetry, comedy, rants & raves! The most eclectic open mic around, in a welcoming gallery setting! 6 pm signup, perform 6:30-8:30 pm. Beginner’s workshop lesson at 7:30 P.M., then 8-11 P.M. Contra Dance with Country Waltzing at the break and the final dance. This is a partner dance but it’s not necessary to come with a partner. We have different live bands and callers. Come on out and Contra Dance with the Old Farmer’s Ball. Free lesson starts at 7:30 PM and the dance starts at 8. On April 27th, 2019, we’re offering up the goods on some of Transylvania County’s finest roads in The Looking Glass Tour! These ultimate samplers showcase the diversity in the terrain found in the county. We’ll have chip-timed results and plenty of rider support with awesome rest stops and SAG Wagons! This is going to be THE road ride of the spring and you won’t want to miss this 5th annual event. Food Box Delivery volunteers needed! WNCAP (Western North Carolina AIDS Project) Dedicated to preventing new cases of HIV/AIDS and promoting self-sufficiency in people living with HIV. WNCAP provides HIV-related client support, prevention, education and advocacy activities guided by the belief that all people are entitled to equal access to health care and disease prevention. WNCAP needs volunteers for the 2nd & 4th Saturday morning Food Box Delivery: 10am-noon. Ride with another team member and deliver pre-packed boxes of food to home-bound, food insecure families living in the Asheville/ Buncombe area. Requires ability to lift 50 pounds, good driving record, and confidentiality. More info at [email protected] , 828-252-7489 ext. 315. 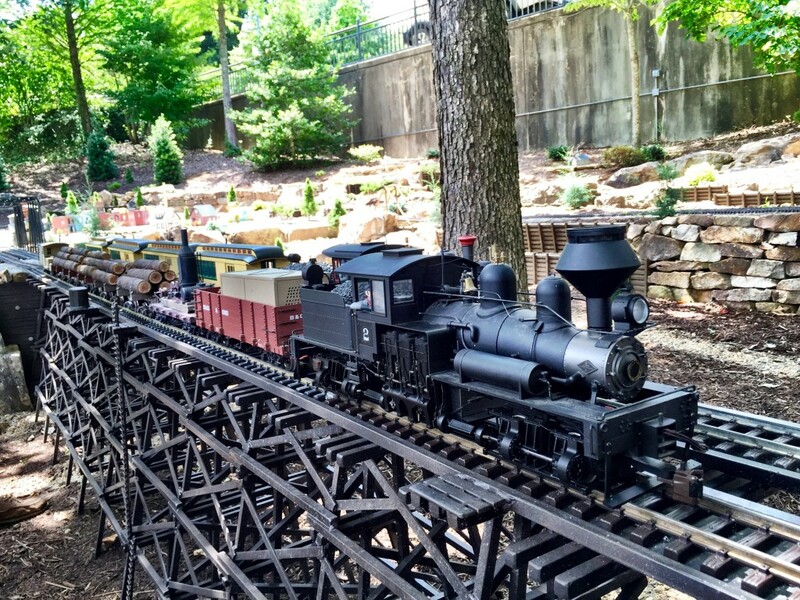 On exhibit Saturdays and Sundays from 12 – 4 p.m., Rocky Cove Railroad is a G-Scale (garden scale) model train that demonstrates the coming of trains to western North Carolina at the turn of the 20th century. The exhibit is located below the Grand Promenade. Please note, Rocky Cove Railroad will not operate in rainy or wet conditions. Join us for Empower Hour, a one-hour program and facility tour where you will experience firsthand the YWCA’s work to bridge gaps in earning power, education, health & wellness and access to childcare. Empower Hours take place twice a month on the first and third Tuesday at 11:30 am. Lunch is served as part of our Empower Hour, so reservations are required. Gather with your community for a FREE tasty meal, lessons on healthy eating and information on Double Up Food Bucks (a new program through SNAP)! Community Dinners are held on the second Wednesday of each month from 6 – 7:30 pm. FREE childcare provided. Seating is limited. Reserve your seat online.